Happy Monday to you all, I hope you are well. :) For my part, my mind is very occupied right now, I'll talk about that more during our Tea Time this week. LOTS going on right now. That's not necessarily a bad thing, but it can be overwhelming, you know? I know that you do, and I so appreciate having you all in my life and heart. 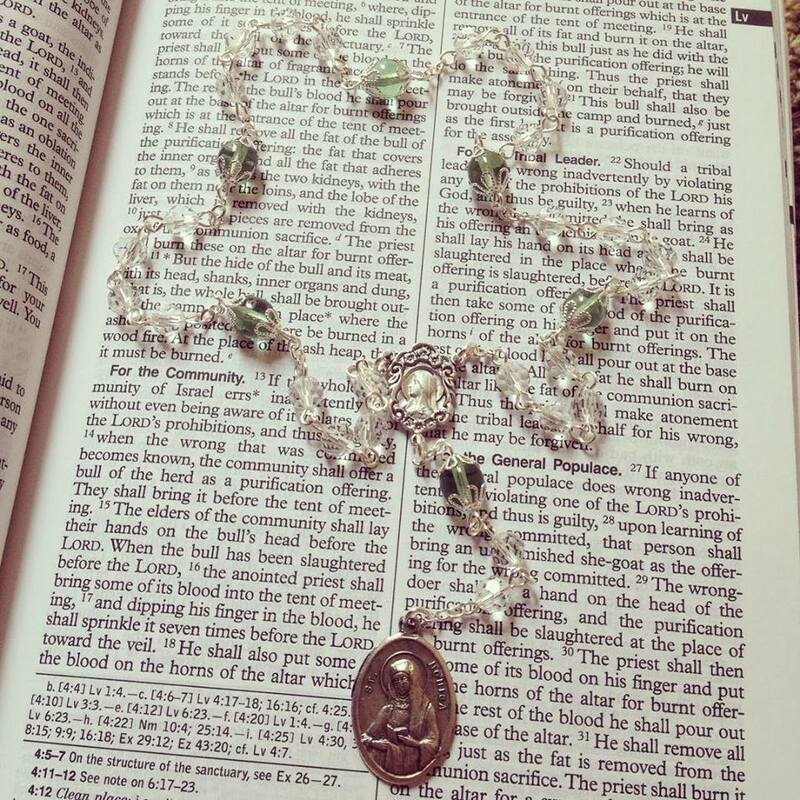 Today, one of the happy things that is on my mind is obsessing over awaiting new rosaries and chaplets. :0 One of aforementioned chaplets is St. Monica, pictured at left here (and if you'd like your own, Rosaries by Allison is the place to go! 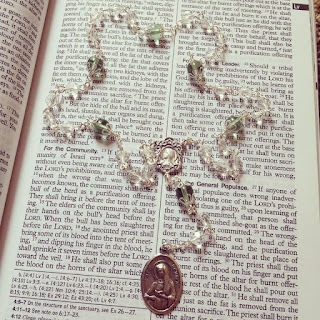 She doesn't have a St. Monica chaplet currently listed, but message her about a custom :)) and her novena begins tomorrow. Your Resident Chaplet Aficionado is planning an audio recording and video tomorrow morning, so if you'd like to pray along, have at it! Oh wait. I have to take Henry to the allergist in the morning. OK, so I am planning an audio recording and video tomorrow *afternoon*. ;-) If you don't have chaplet beads, you can still pray along with me this way! You can also sign up with Pray More Novenas to receive the novena prayers in your email inbox each morning. I'm doing that as well. I'm just also adding in the chaplet, because I am a Chaplet Nerd. My St. Monica chaplet is currently at the post office, and I have signed up for text alerts of when it makes any movement at all, because I am a stalker like that when it comes to things I am very excitedly expecting. I wish I could just go there and demand my rosary-containing envelopes, but I restrain myself, lest they think me odd. ;-) But I CANNOT WAIT to retrieve the mail when I get home later! Who else is planning to pray the St. Monica novena?! I would love to hear from you! I'll be praying the novena.